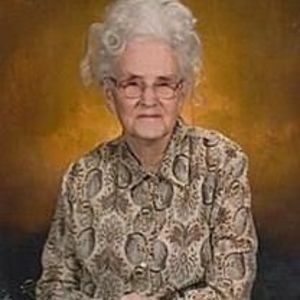 Lillie Mae Jones, 96, passed away Friday, December 8, 2017, at her home in Booneville. She was born June 7, 1921, to John Clifton and Nora Bell Nichols Cain. She was a member of Biggersville Pentecostal Church. She enjoyed sewing, gardening, yardwork, fishing and especially camping. She is survived by three sons, Ray Jones, Tim Jones and Ronnie Jones; two sisters, Sadie Jones and Mary Petty; four grandchildren, Raina (Robby) Michael, Richard (Rhonda) Jones, Sean Jones, and Ronnie Lee Jones; and nine great-grandchildren. She was preceded in death by her husband, W.Y. Jones in 2001; her parents; one sister, Rachel; and two brothers, Marshall Cain and Joe Cain. Visitation will Sunday from 4:00 P.M. until 8:00 P.M. at the funeral home.